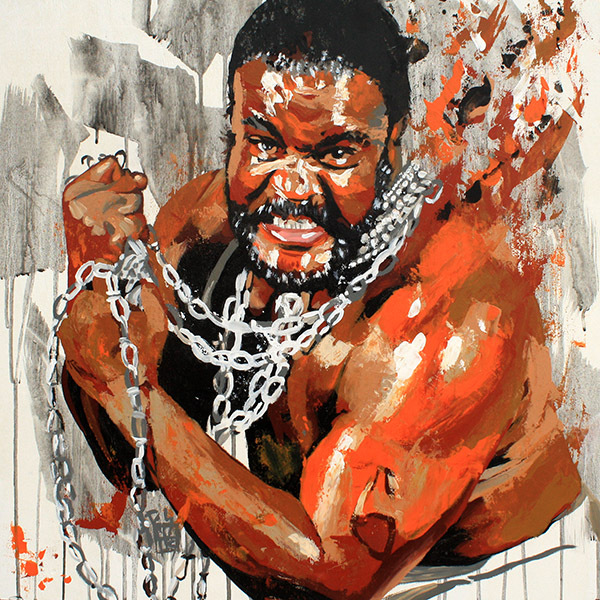 The Junkyard Dog was a true trailblazer in his time and is easily one of the most beloved figures in the history of professional wrestling. Sylvester Ritter was born on December 13, 1952 in North Carolina, going on to play football for Fayetteville State University, twice earning honorable All-American status and graduated with a political science degree. He began his wrestling career in the Tennessee area and later for Stu Hart’s Stampede Wrestling as Big Daddy Ritter. In the early 1980’s he began working for the Mid-South Wrestling promotion, where booker Cowboy Bill Watts repackaged him as the Junkyard Dog. He quickly became popular with the fans and was soon the face of the company, becoming the first African-American to be featured as such. During his time on top he had a historic rivalry with Michael PS Hayes and the Fabulous Freebirds, where JYD was ‘stricken blind’, making him unable to see his newborn daughter. This rivalry was white hot and easily sold out the SuperDome in New Orleans and ended with the two battling in a dog collar match. He also had notable rivalries with Ernie ‘The Big Cat’ Ladd, Ted DiBiase, Kamala, King Kong Bundy and another hot feud with ‘The Natural’ Butch Reed. In 1984 the Dog debuted with the World Wrestling Federation, quickly becoming a fan favorite there as well. During his four years there he had notable matches against such luminaries as The Iron Sheik, Randy Savage, and Harley Race. In 1988 JYD made his way to World Championship Wrestling at Clash of the Champions IV, coming to the aid of Ivan Koloff. In WCW he renewed rivalries against Butch Reed and Ernie Ladd, was part of a faction with Sting, Paul Orndorff and El Gigante and even defeated a young man named Mean Mark Callous who has a striking resemblance to The Undertaker. In 1991 he won his first title in WCW by joining with Ricky Morton and Tommy Rich to defeat Dr Z, Dutch Mantell and Buddy Landell for the WCW Six-Man Tag-Team Championship. After leaving WCW for a brief time in August of 1991, he returned in February of the next year to save Ron Simmons from Abdullah the Butcher. On September 21, 1992 he defeated Eddie Gilbert for the United States Wrestling Association Unified World Heavyweight Championship, but lost it a month later to his long-time rival Butch Reed. He finished out his time in WCW battling against Ricky Morton, Diamond Dallas Page, Kevin Nash as Vinnie Vegas, and briefly teaming with Jim Neidhart before leaving in 1993. Ritter worked on the independent circuit until his premature passing on June 2, 1998. He was inducted into the Professional Wrestling Hall of Fame in 2012 and the WWE Hall of Fame in 2004. About the piece: Sometimes I have a painting that works exactly how I want it to, and this was one of those. I watered down some black paint and applied that to the background, letting it drip and be as organic as it wanted. Then I came in with the figure, first blocking in colors on the torso, then applying a second coat with a palette knife to get a more vibrant texture and energy. I then did the chains, the arms, and finished with the face. I don’t say this too often, but I’m really proud of this piece and I hope it serves as a testament to the legacy of Junkyard Dog.